Pain is something we too often have to live with as we get older. Whatever part of the body it’s radiating from, pain can disrupt sleep, normal activities, and our peace of mind. How can we cope with pain when it hogs all of our attention and seems to take over our life? Last week, I discussed the pain I had in my feet. After my feet had grown wider, walking on the treadmill hurt. That was easily remedied by stretching my sneakers and wearing thinner socks. But sometimes pain is a bigger problem. I went to my oral surgeon for a routine scraping a few days ago. I’d missed my last appointment six months prior and so expected to have some discomfort. I wasn’t, however, prepared the kind of pain that hit later that day. At first, my teeth and gums were sore. Then, after a light meal, my teeth began to throb. Because I had a meeting, I took a couple of Extra-Strength Tylenol and headed out the door. The pills, along with the distraction of the other people, worked to keep the pain at bay. But as soon as I got home, the pain returned and grew more intense all afternoon. I took some Advil PM and went to bed. The next morning, the whole left side of my face was hurting. It was Friday, so my dentist’s office wouldn’t be open again until Monday. I was facing a long weekend of pain. I hate taking pills. I thought about the opioid crisis and about how much my stepmother had come be dependent on powerful pain meds the last years of her life. The idea of swallowing dose after dose for the next few days didn’t sit right with me. So I tried an ice pack. That helped for a while. But after each meal, a surge of pain returned. Next I tried a heating pad. Then I remembered a prescription toothpaste I’d gotten after gum surgery years ago. I even bought a tube of Oragel. Everything helped for a while, but the pain kept returning and was growing more intense. That night, I decided not to take Advil PM again. I thought about how I would deal with chronic pain later in life. There had to be a non-pharmaceutical, more natural method. 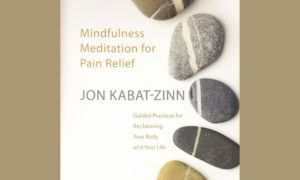 Remembering something I discovered while in grad school, I put in my earbuds and listened to Jon Kabat-Zinn’s body scan meditation. That did the trick. It moved my attention first onto my breath and then onto one part of my body after another, and I was able to relax, minimize the pain, and fall asleep. Today is my last day to cope before I can get to the dentist. I’m afraid to eat anything because the dull pain I feel right now will explode into lightning bolts of agony. Wait a minute! That’s some really stressful thinking that won’t do me any good at all. By expecting the worst, I’m only raising my stress level and makes things worse. So back I go into my Jon Kabat-Zinn library. He created the Mindfulness-Based Stress Reduction program to help tens of thousands of patients living with chronic pain. I pull out his program on mindfulness for pain. All I wanted to do was escape my pain. But listening to his program, I already feel better. The pain is far less noticeable right now. Please excuse me while I give the rest of the program my full attention. This feels too good to miss.